All of the Emergency range come with 3 years standard warranty, 5 years extended (through application) and 4 years standard battery warranty. The UEM is one of Kosnic’s most popular products and can be used with any class III driver luminaires. 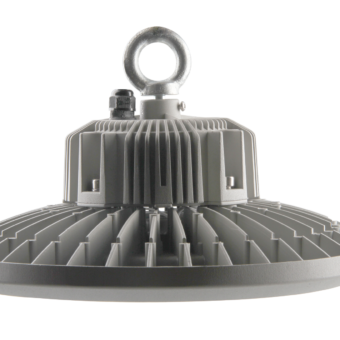 The module comes in standard or with Automatic Self-Test (AST) and both versions can be installed within a luminaire or within the ceiling void. The DD EME is for our DD lamps and are sold in standard or with Automatic Self-Test (AST) versions. It is designed for installing within the fitting to provide a battery back-up supply in the event of a power cut through the supplementary socket on the LED DD lamp. Kosnic have two IP65 emergency exit bulkheads/signs: the Mulu and the Manot. The Manot is adaptable to be surface mounted, recessed or installed with a tilting bracket. It is supplied with the downward arrow exit sign for wall mounting and can be used without signs as an emergency light. The Mulu is supplied with adaptable self-adhesive graphics that can be arranged to indicate escape routes as necessary but can be used with or without the emergency exit graphics. The Nitro is a discrete recessed fitting that provides emergency lighting only. The downlights are available with a standard lens design or a corridor version lens. Kosnic supply two Twin Spot emergency lights with both providing fully adjustable heads to allow the best coverage. The twin spots are non-maintained and come in 3W (IP20, Class II) and 7W (IP65, Class I). Typical applications include warehouses, factories, industrial sites and long corridors.